Mayo Clinic Phoenix, WestWorld of Scottsdale, and the Wildfire Golf Course. Toscana Condo Rentals brand new, apartment style, luxury condos deliver so much more than standard Phoenix condominiums - Prime Desert Ridge Location, Spacious Gourmet Kitchens, Free High Speed Wi-Fi, and 1, 2 and 3 Bedroom Suites. Short term leases are available. 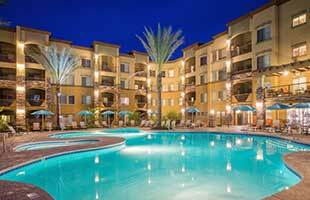 Explore Phoenix condo rentals now. Room to entertain and relax with spacious living and dining areas, gourmet kitchen and luxury master suite. Over 1,200 square feet of stylish living space ideal for relaxing, entertaining and extending your stay in the Scottsdale area. Relax in N. Phoenix with your closest friends & family members! Three spacious bedrooms accommodate everyone. 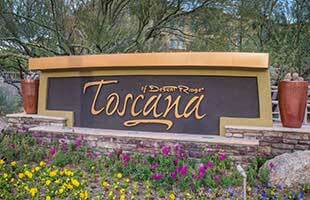 Experience Toscana Condo Rentals at Desert Ridge, North Phoenix's premier luxury condos. Located just on the border of the prestigious Scottsdale area and close to all of Scottsdale's best shopping, dining, and golf. Surrounded by two championship golf courses at Wildfire's Golf Club and two renowned shopping and dining centers, High Street® and Desert Ridge Marketplace®, Toscana is the premier destination for Phoenix / Scottsdale travel. Toscana offers Exclusive Amenities and so much more than other Phoenix condo rentals. Experience Phoenix the way it was meant to be. Our apartment style condos offer secure, underground parking, high speed Wi-Fi, short term leases, and corteous on-site staff to help ensure that your stay is comfortable. Our luxury condo rentals in Phoenix put you in the heart of all Scottsdale has to offer. Our Phoenix luxury condo rentals puts you within 30 minutes of all the attractions and major events in Phoenix. Toscana is the PERFECT Scottsdale destination for singles, couples, and families alike. Explore N. Phoenix in style with the Toscana VIP Club Program offering special discounts on area dining & attractions. Lush landscaping and meandering trails provide a serene backdrop to our Scottsdale condos and your Arizona extended stay. Well-equipped outdoor kitchens and barbecue grills are ideal for al fresco dining in the cool desert evenings. Toscana's resort-style pool and sundeck will be your favorite spots to bask in the warm Arizona sun. Go for a refreshing swim in the heated pool and whirlpool - the ideal way to unwind after a day exploring Scottsdale and Phoenix attractions. Gather for family time in the Club House Media Center and Billiards & Game Room. 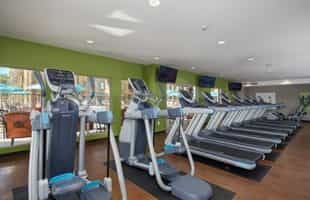 Maintain your healthy routine with our fully-equipped on-site fitness center and tennis courts. Featuring cardio and weight training equipment and his and her steam rooms with private lockers, Toscana supports your healthy lifestyle. Good location close to shopping and restaurants and 1/2 hour to airport. With numerous things to do near your Phoenix condominium, your Arizona days can be as active or relaxed as your mood. From the moment the sun rises over the Sonoran Desert until long after it sets, North Phoenix offers exciting attractions, world class dining, championship Arizona Desert golf courses, and nationally acclaimed events.